Grace went out and bought a hat, and dressing for her wedding consisted in putting on this hat. As the occasion was so momentous she took a long time, trying it a little more to the right, to the left, to the back. Nanny fussed about the room in a rustle of tissue paper. Grace did so with some relief, shook out her pretty golden hair, and gave the hat to Nanny, who, since it was made of flowers, looked rather like a small, cross, elderly bridesmaid clasping a bouquet. The Blessing is admirable, deliciously funny, consistent and complete; by far the best of your writings; I do congratulate you with all my heart & thank you for the dedication. Anyone familiar with Waugh’s personal writings and letters will know what high praise this is, and how unusual – he never tried to be polite or tactful, and other works of hers got some very harsh words from him. So he must have loved this book. Three of Nancy Mitford’s post-war books – The Pursuit of Love, Love in a Cold Climate, and Don’t Tell Alfred, all frequent flyers on the blog – are among my favourite novels of all time, and I have read them many times. The pre-war ‘comedies’ are fairly awful, and I usually file this one along with them – and rarely re-read. After reading a biography of Nancy (there’s a list of books about the Mitfords at the end of this blogpost) I gave it another go, and, yes, it is still a mess. There are some excellent scenes in it, some great conversations, and marvellous clothes. There are dinner parties and a ball. But all these good things are linked together with a ridiculous non-plot, and horrible and unbelievable characters. And – some really terrible sexual politics. Grace, above, marries in a whirlwind: and then her aristocratic French husband disappears off to the war, leaving her pregnant. When he returns he carries her off to France, to spend time in a country chateau in Provence, and a fancy house in Paris. The child, Sigi, and his Nanny are two of the most tiresome characters you could imagine, and there are also swathes of ‘satirical’ discussions of America, France and the UK. Grace – as foretold from the brief scene above – is going to find out that France is superior to the UK in every way, and that she is uneducated and badly-dressed and has absurd expectations of marriage. Eventually she walks in on her husband in bed with someone else and leaves him. The rest of the book concerns Sigi’s attempts to keep his parents apart (because of the possibilities of playing them off, and finding generous would-be step-parents) despite its being clear that they could still be happier together: this was probably more original on publication than it seems now. But – and this does beggar belief, even in 1951 – every single other character thinks Grace is stupid to have left him, and many of them believe she is very much in the wrong because she doesn’t understand Charles-Edouard’s way of life. All her friends, and her father, are impatient with her for being quite so puritanical: they give her a hard time and tell her she is a fool. Unfortunately, this for me nibbles away at the enjoyment of the other scenes. But as a whole the book seems to lack plot and structure – it is a series of scenes each designed to show some point Mitford wants to make about life, morals, people. Such a pity. 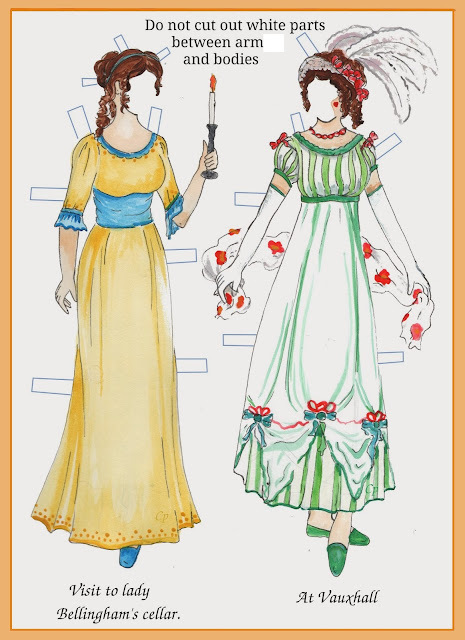 And what a great opportunity to show some fashions of the right time – Grace has to get some cotton summer dresses in Provence, and later goes in to mourning. The coloured fashion pics are from a French magazine called Le Petit Echo de la Mode – a marvellous resource which long-time blog supporter and friend JS recently introduced to me. The black and white photos are from Kristine’s photostream. Top one is a 1940 ensemble. The other is a tulle Dior balldress, photographed in the Paris Opera House, 1948. I have to admit, Moira, I'm not sure this would be for me. I can handle irksome characters. But a non-plot sort of a plot, and the sexual politics, would put me off, I think. It's just not my thing, although I'm glad you found some things to like about it. Yes, that is true, but there is more to the books than that. And Mitford is very firm about the need for education and occupation for women -she just wraps it up in the aristocratic trappings. And Love in a Cold Climate is one of the least romantic books ever written. I am glad to know that this is not one to read, but I am also glad I was reminded of the other books Nancy Mitford wrote. I am coming up with a new list of classics to read and will put one of those on the list. Oh good, will be interested to know what you make of her. But definitely one of the others - Pursuit of Love is shorter I think, but Love in a Cold Climate is her masterpiece in my view. Not reading this one in my all-female November reading - sorry!